So I've been on a "fermented" kick lately, enjoying kombucha and fermented veggies on a daily basis. Last week I shared how to brew your own kombucha. 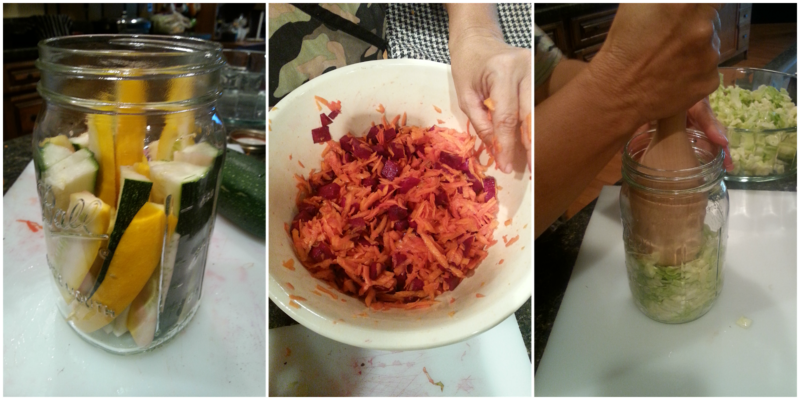 Today, I'd like to share how to ferment your own veggies. My cousin, Debbie, showed me how a few weeks ago. It's SO easy, you can prepare them in about 10 minutes. Seriously. However, it takes 4 to 7 days for the veggies to actually ferment. But why should you ferment vegetables to eat? Well, just like kombucha, fermented veggies contain important good bacteria that your digestive system needs - probiotics. Lactobacillus is a naturally occuring bacteria on fruits and vegetables. When fruits and vegetables are placed in an oxygen-free environment, the bacteria converts sugar (naturally found in the veggies and fruit) into lactic acid, which is technically referred to lacto-fermenting. Veggies that have been fermented this way will have a sour/tangy flavor, and are quite delicious - and so good for you. Directions: *Wash vegetables thoroughly. *Cut up/shred/spear veggies. *Pack your veggies into the mason jar, leaving about an inch of space at the top. Don't be afraid to squish them down. *Pour in about 1 tablespoon of sea salt and fill the jar with filtered water until veggies are completely covered. *Place lid on jar and screw on tight. *Place jar on kitchen counter, or somewhere out of direct sunlight. Note: cabbage requires a bit more prep time, as it needs to sit in a bowl, shredded, sprinkled with sea salt, and covered, for a few hours before placing in a jar. It also does not require the filtered water, as it has enough water content naturally. And that's pretty much it. Let the jar sit on the counter for about 4 to 7 days. Bubbles may form at the top waterline, but that is normal. At day 4, check the veggies. Taste them and see how you like the flavor. If you want it more sour/tangy, let them ferment longer. It's not an exact science. Refrigerate when you want the fermenting process to stop. So far, I've fermented carrots and beets, zucchini, squash, bell peppers and cabbage. I'm an incredibly picky eater - strange or bold flavors aren't something I like to try, and I can't tolerate pickles. However, I love fermented veggies! I like to cut zucchini and squash in spears to ferment and they're fabulous. You can add a side of fermented veggies to any meal. Some people like to use a starter culture, or whey, to start the fermenting process on vegetables. I don't do this. I let the veggies do their natural thing. Here are some more in-depth (with video) instructions on how to ferment vegetables by Nourishing Meals and Purely Twins. Thanks for reading! 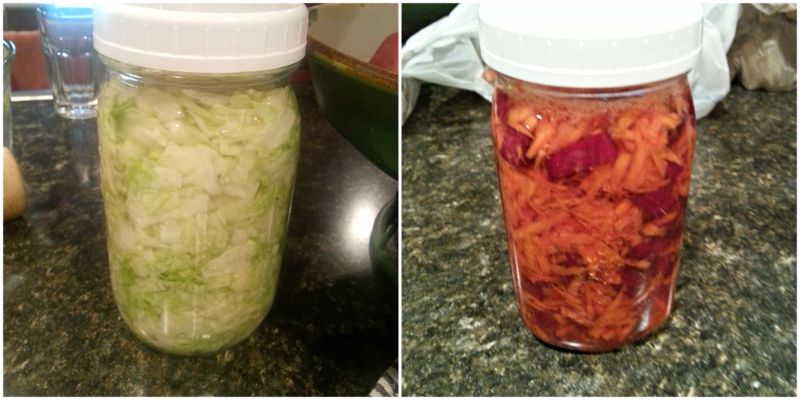 Have you ever tried fermented vegetables? Did you like them? Hey there! I just stumbled across your blog through your ad on Yes Deer. I love what you have going on here; I'm a big fan of country living as well :) Can't wait to read more. I am so glad you shared this and will be trying to ferment some of my own this weekend! Hi there! Just found this via Twitter. 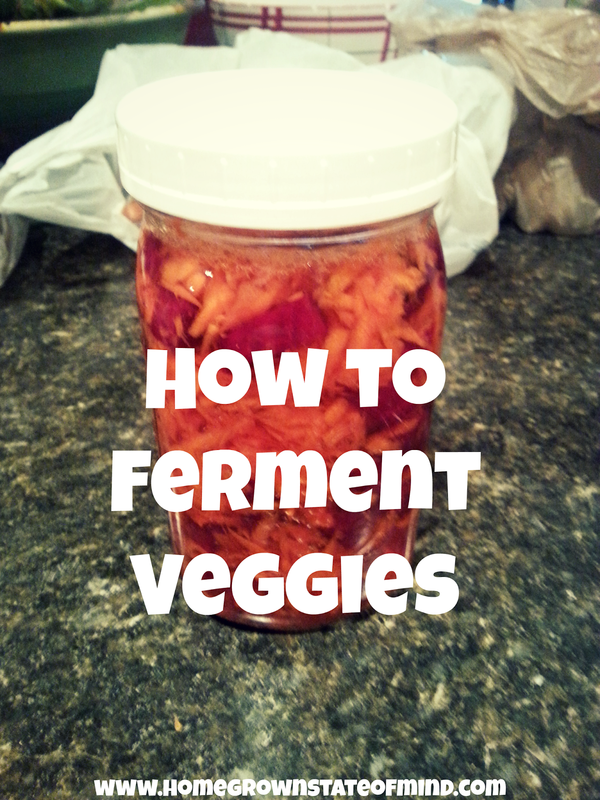 Your guide makes it really simple, I really need to get creating my own fermented veggies! Hehe thanks for the info! That looks simple enough that I, even I, might be able to do it.